Here is some guidance on how to use the interactive maps. There are a variety of ways in which you can use the interactive maps, which is underpinned by Open Street Map and World Imagery satellite maps. This means that there will be an increasing level of detail the further you zoom in and you can view either as a traditional map or as a real world satellite image which shows the buildings and terrain. There is a drop-down menu towards the top right of the screen to change base maps. Detailed maps have been created for England. By clicking on a location it will generate an information box on the right of the screen (under the ‘Detailed maps and statistics’ menu), which will tell you what percentage of that area falls within each of the nine categories and how it ranks when compared with other places. You will also see that there is a hyperlink to the detailed PDF map for the location, where you can download or print that map. For example, if a user were to zoom to an approximate location then tick the box which showed district boundaries, it would show the districts in that area and on clicking a specific location, it would generate detailed information for that location and show a link to download a PDF map. 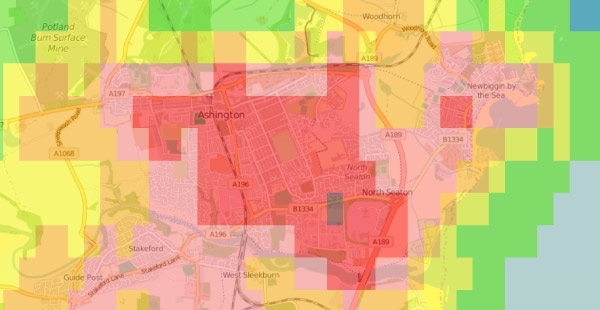 You can use the ‘Search Tools’ menu to look for the first half of a postcode and generate a printable map based on that postcode (these maps will not show details of the percentage of an area in each lighting category). There are also drop down lists of districts, counties and National Character Areas, where you can start to type the area you are looking for and it will bring up a shortlist of locations. For example, if you wanted to find North Devon district, then begin writing the first few letters and a list will appear for you to choose from. Under the ‘How to use the maps’ tab you will find a sample map which explains the information displayed in each map.